I acquired this stereoview just this last weekend. It was in an antique shop but was originally part of that Chambersburg auction last year that resulted in that hoard I bought off of eBay in December. 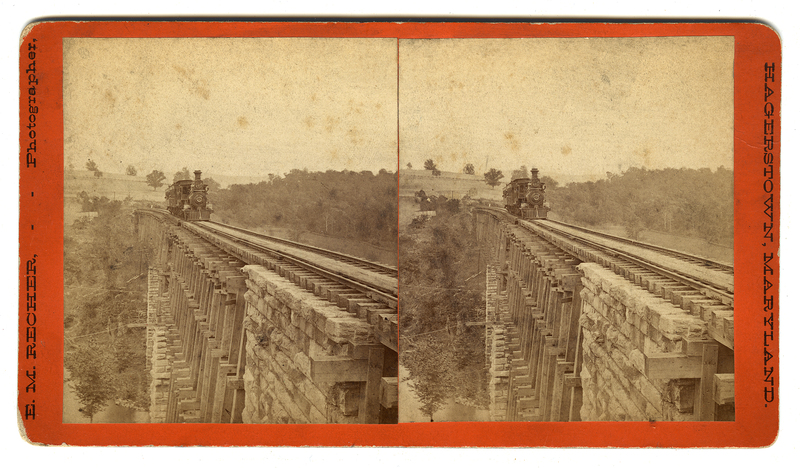 The seller held back four train stereoviews, all with trains. Very exciting stuff. This is one of two of Long Bridge just west of Keedysville. It was built in 1867 by the the B&O as part of a spur from Hagerstown to Keedysville. Many of the Antietam battle veterans took this route to the battlefield. It was the longest wooden trestle east of the Mississippi. It was torn down around 1967 and all that is left is the pillars. I tried to get a Then and Now this past saturday, but it turns out that the remnants are on private land. Nonetheless, after much snooping and door knocking I have managed to wrangle an invitation to see the bridge on the next warm weekend. I will keep you posted. On a side note, the title is written on the back in O.T. Reilly'ds hand, but someone has tried to erase it and has written the same text in their own hand. This was a naughty thing to do. Hello. I'm Stephen Recker and welcome to my blog. In it I will be discussing the different projects I am working on related to the American Civil War with a focus on photography related to the battle of Antietam. I am particularly interested in how the battlefield has been interpreted throughout the years. I will be discussing how it was done then and how new technologies can be brought to bear to bring life to those old materials as well as new ones. See the 99 Places Every Antietam Battlefield Guide Should Know. 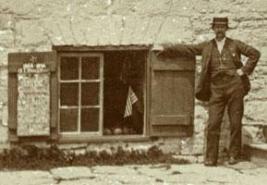 The stone observatory on the Bloody lane is now finished and ready for visitors. The view from this point alone is worth a visit to the famous Bloody lane as you can take in the entire right to the left nearly four miles. There will be, when all planted, nearly four hundred markers, giving one a good idea of the entire battle field with the advantage of the good roads. Every body ought to visit it and make a study of this great battle.